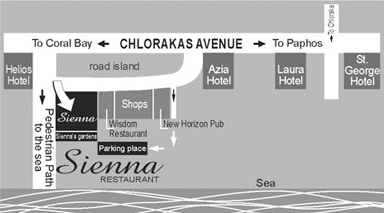 The Sienna Restaurant is easy to find, being located on the main Paphos to Coral Bay coastal road, please find a simple map below, together with the Google satelitte map to the right hand side. Driving from Paphos towards Coral Bay, just 200m past the ‘St George’ traffic lights in Chloraka, you’ll see Sienna Restaurant set back on the left hand side. We have a private lit parking area behind the restaurant. Please follow the directions below.